Born for the FF (Front engine / Front drive) competition, the Carbon Hybrid LSD is another formidable option for the performance LSD turning! ATS, based on the invaluable know-how and practical experience from the professional driver, Mr. Mitsuhiro Kinoshita, developed the high initial torque carbon LSD Spec 3, 4, and 5. In order to provide an optimal setting for variety of FF race drivers, ATS has combined the merit of Carbon LSD and metal LSD. The new carbon LSD - Carbon Hybrid offers the freedom of choosing a carbon / metal ratio depending on the course condition and driver's preference. The initial torque is set at 13kg-m to 15kg-m and ATS is convinced this LSD will be another strong winner in the 2012 racing season and beyond. 1) The LSD is activated at a lower torque than the metal LSD and generates less under steer. 2) It maintains the higher initial torque longer than the carbon LSD. 3) Several choices are offered in carbon / metal combination. 4) It can superbly handle the tough FF driving condition with slick tires. 5) The LSD case is made of heat treated forged chromoly for the maximum strength. 6) Ample optional & spare parts are available for excellent adjustability. 7) Outstanding choice for the endurance race, racing with slick tires, and competitions. Important - it is very important to monitor the differential oil temperature to keep it under 150 C degree (302 F). Continued driving with the differential temperature above that point might cause the carbon chips peeled off. 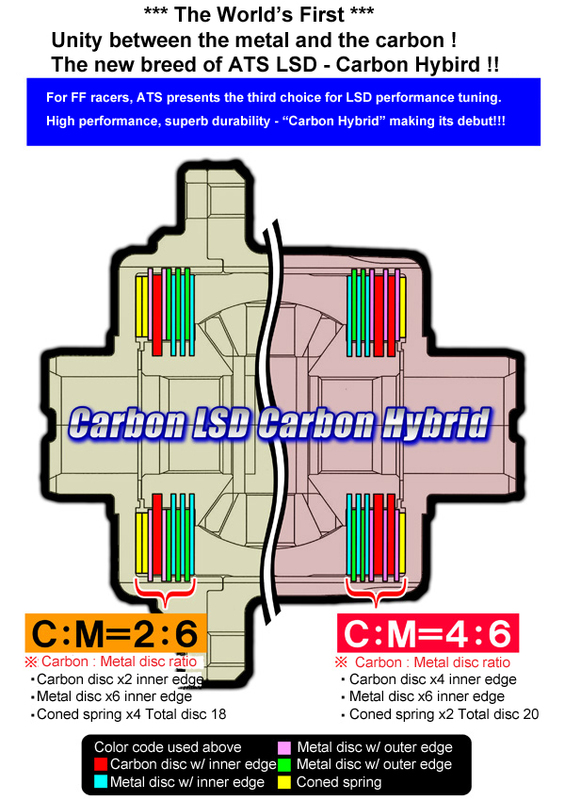 The last two digits specify the carbon / metal ratio of the LSD. For example, CHFB8732HB28 (carbon hybrid for DC2) has the 2 carbon discs (w/ inner edge) and 8 metal discs (w/ inner edge). CHFB8732HB46 has 4 carbon discs and 6 metal discs.